Leptoptilos is a genus of very large tropical storks. Two species are resident breeders in southern Asia, and the Marabou Stork is found in sub-Saharan Africa. These are huge birds, typically 110-150 cm tall with a 210- 250 cm wingspan. The three species each have a black upper body and wings, and white belly and undertail. The head and neck are bare like those of a vulture. The huge bill is long and thick. Juveniles are a duller, browner version of the adult. 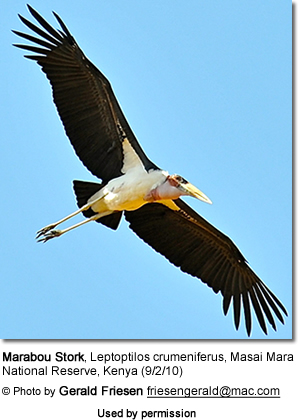 Leptoptilos storks are gregarious colonial breeders in wetlands, building large stick nests in trees. They feed on frogs, insects, young birds, lizards and rodents. They are frequent scavengers, and the naked head and neck are adaptations to this, as it is with the vultures with which they often feed. In each case, a feathered head would become rapidly clotted with blood and other substances when the bird's head was inside a large corpse, and the bare head is easier to keep clean. Most storks fly with neck outstretched, but the three Leptoptilos storks retract their necks in flight like a heron. "Leptoptilos" siwalicensis from the Siwalik deposits (Late Miocene? - Late Pliocene) may belong into this genus, or to a closely related one.